Skill points are what defines your character and its power in The Elder Scrolls Online. They’re ultimately more defining than your class, since you don’t specifically even need to use any of your class skills, including the ultimates. 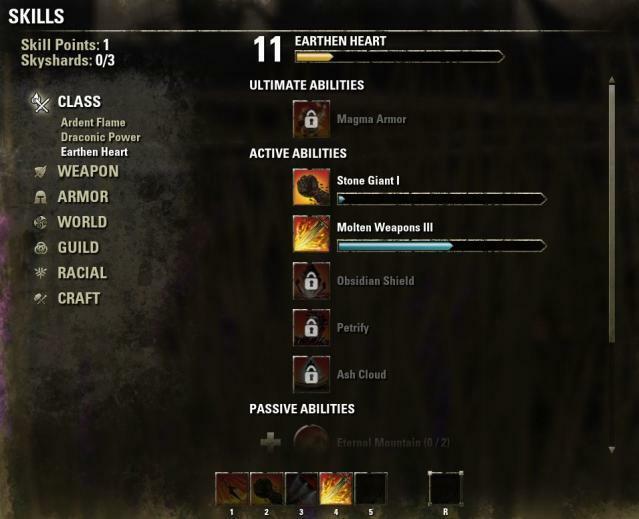 You can only equip five active skills and one ultimate, so you don’t need a lot of points to fill out your bar, but you do need a lot for passives and morphing. You gain one skill point per level, in addition to one skill point per level in Alliance Wars, in addition to quests that provide a skill point. You also gain a skill point upon completing three skyshards. You get a skill point the first time you complete a dungeon. All in all, there are over 300 skill points to obtain in the world and somewhere around 450 skill points for all of the skills currently in the game. Luckily, you can reset your skills so it’s not a huge deal and realistically you only need a few to unlock the and morph the skills you’ll physically need on your action bar. The rest obviously go into passives. Passives work no matter what, unless they have some kind of pre-requisite, like having a weapon equipped or the such. The skill descriptions are pretty good about this kind of thing. Each level you get one skill point, up to a total of 50. You also get one for Veteran Points, later on, which I am to understand is nine additional points. Every 3 skyshards is a skill point (up to 107 total points). You can use the achievements window to give you hints on the locations, for a spoiler free approach to locating them all. Various quests, including public dungeon quests, grant a skill point. You get a couple per map from the story quests, then a couple per map from the major city quests, on average. Ranking up in the Alliance War will give you one additional skill point. You can actually get a handful quickly at the lower ranks. You get one skill point for completing a public dungeon challenge. Skill points can be spent on obtaining a skill or morphing a skill. You must morph a skill in order to continue leveling it. Skills are unlocked through leveling a specific skill line (which is done by gaining experience in whichever way the skill line gains XP, from killing specific enemies to using specific weapons) or through reading books throughout the world. Once you obtain a skill, it’s leveled up through using it, until it’s ready to be morphed. Once morphed, it will continue to level up. To reset skill points in ESO you simply need to visit one of the reset shrines located in Elden Root (Aldmeri Dominion), Waryrest (Daggerfall Covenant), or Mourhould (Ebonheart Pact). Here you can reset your skill points for 100 gold per skill point. That’s a lot! Generally speaking, you’ll only need to do a reset early on, because after a certain point you’ll have so many points that you’ll be unlocking unnecessary skills for fun anyway, so it shouldn’t be such a huge problem. While you’re there, you can reset your attribute points as well if you so choose. That’s about it for skill points in ESO! Good luck out there in Tamriel.